We are happy to present you the Vanessa Armchair, the last born in the Atelier Collection with the aim to furnish the most exclusive locations. 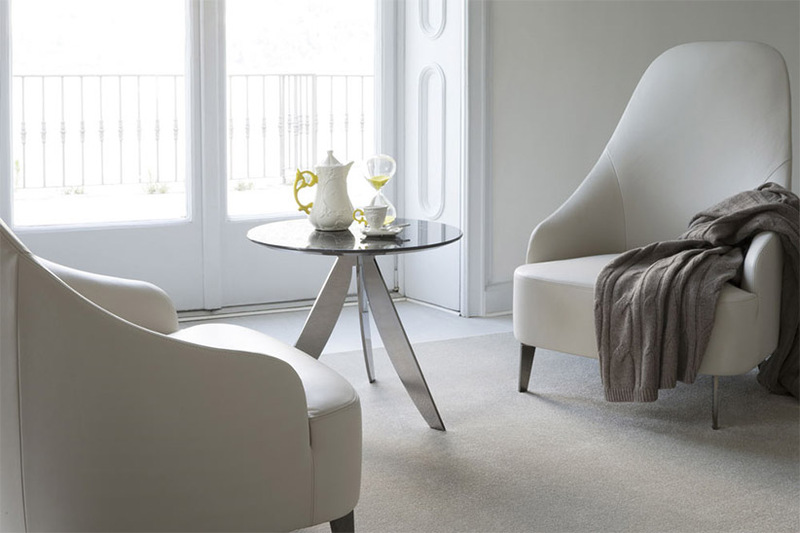 Modern and comfortable, Vanessa has been created by the BertO Upholstery Tailoring to decorate the contemporary spaces as well as the more classic ones. 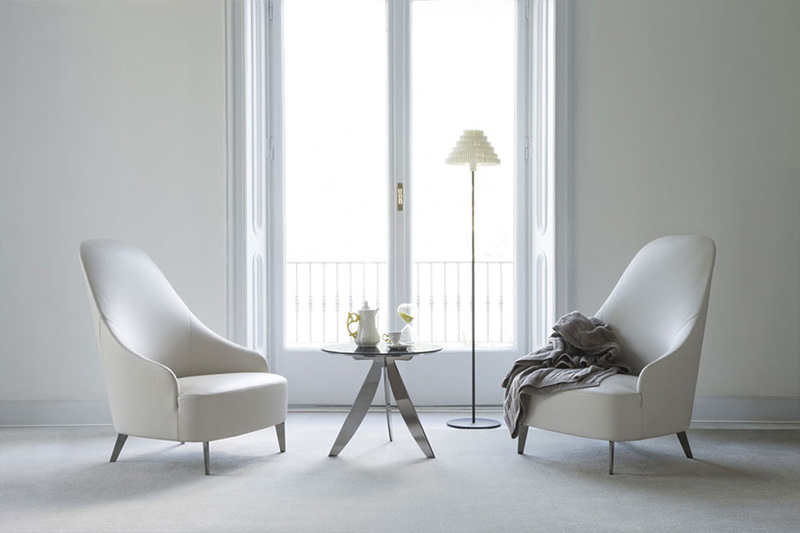 The design is characterized by curvy and regular volumes thanks to a non-deformable polyurethane foam padding made by the masters of BertO upholsterers. Available in light grey color leather upholster, Vanessa speaks out its linearity and invites you to relaxing moments to spend together. The high backrest embraces your shoulders and holds your head with a delicate sense of protection. The tailoring details, such the 2-pins-stitching, decorate gently the seat and the back rest profile bringing out the shapes of the armchair. Vanessa sets gently on the ground: its feet, original design by BertO Studio, are made of steel with black chromed or golden lacquered finishing. It is available even with swiveling base. Our aim is to imagine Vanessa in your home, to design it, to choose the upholstery and to customize it according to your needs. In the Atelier Collection you can also find the version with anthracite grey velvet. Set to together with the sofa Danton, Vanessa improves the exclusivity of a modern and sumptuous location becoming the real star of the fashion and relaxing style. Both with leather or fabric upholstery, Vanessa can find its spaces even in other rooms: bedrooms, anterooms, home recesses or in open spaces such as sitting rooms and receptions in hotels and resorts. You can customize the Armchair Vanessa as for upholstery, details and finishing. Choose among 3500 upholstery possibilities, such as cottons, linens, velvets, leathers and famous brands as Etro, Romo and C&C. 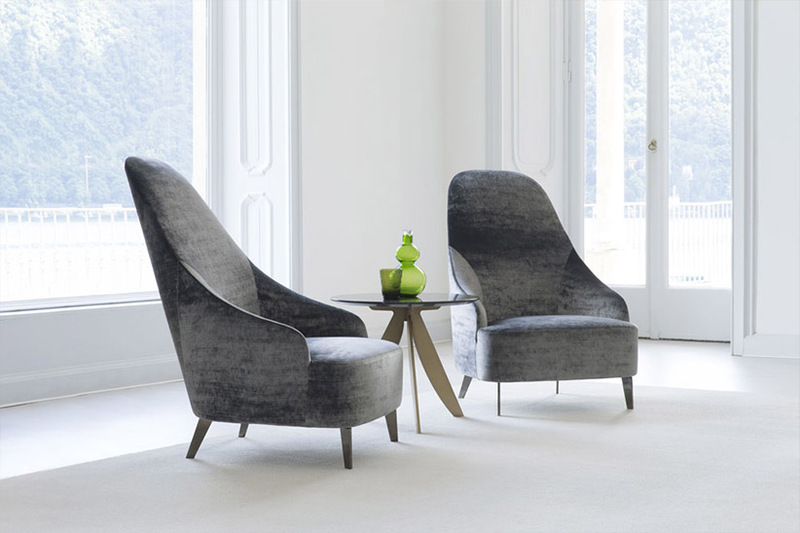 You can buy the Armchair Vanessa in our showrooms in Meda or Rom, as well as online. Discover how to buy by sending an email to servizio.clienti@bertosalotti.it or by calling the number +39-0362-333082.